I scanned a couple of new ads and added two I am not sure I shared before. I have this one down as probably encilled by jack Btts, but inked by someone else at Johnstone and Cushing. In the mid to late fifties Bob Bugg did various cigarette ads for Reynolds brands. Most famous of course (and I show just about all of them if you follow the link) is the Sgt. 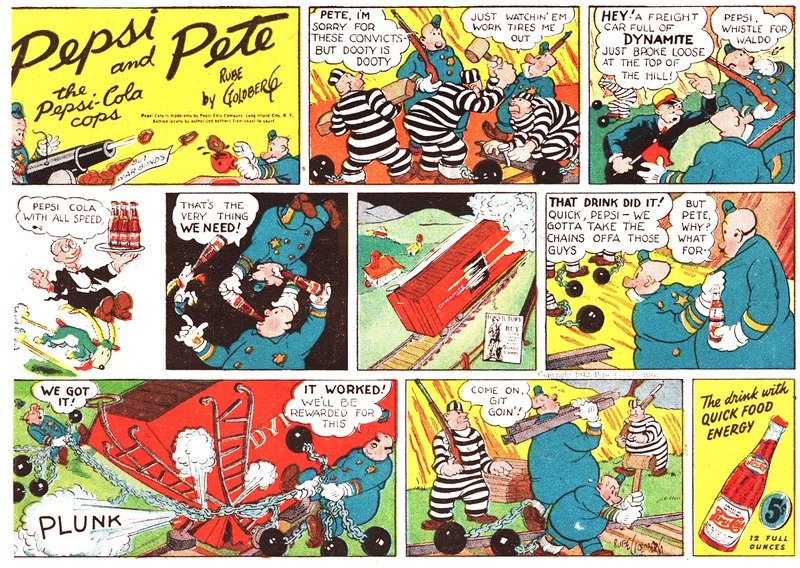 Bilko series he did for Camels. 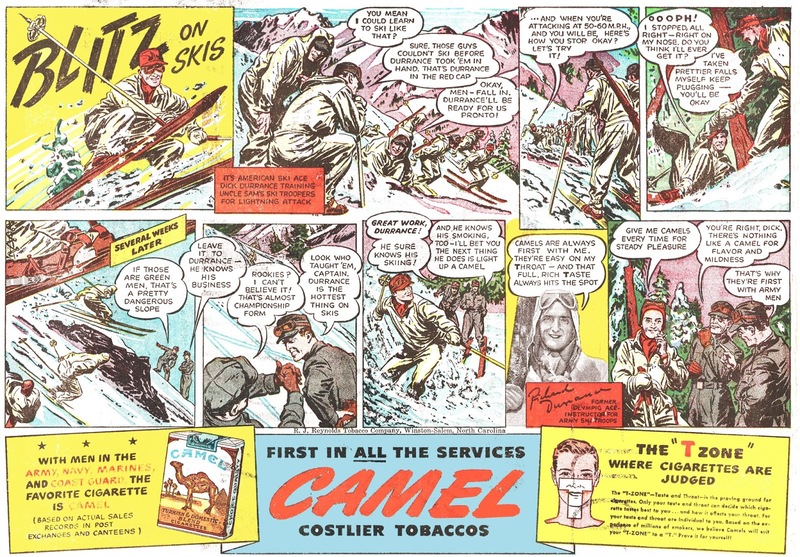 But in addition to those he also did a couple of single Camels ads. I have shown two, and this is another one. Up to the midfifties, Camels were most famous for their celebrity endorsement comic strip ads, like this one. 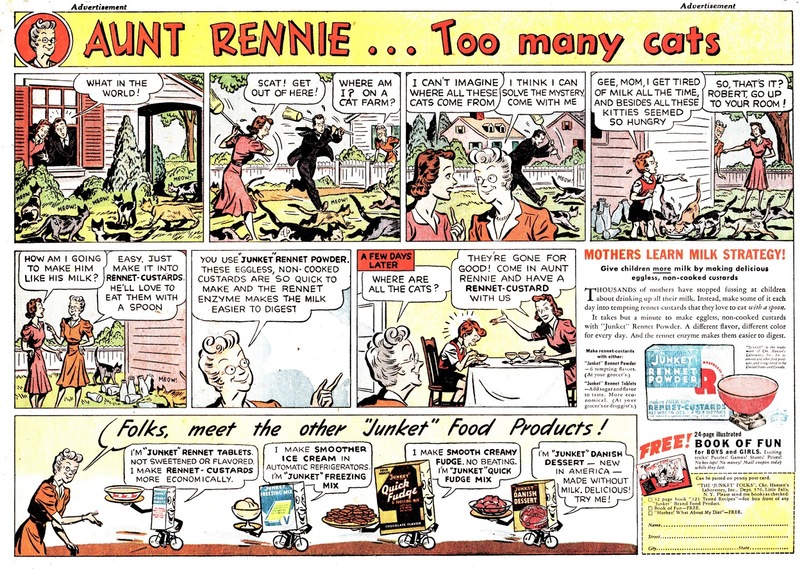 I have shown quite a few of these weird ads which seem to have been produced by Lou Fine. Most of them in black and white, taken from microfiche online sources, but some selfscnned and in color, like this new one. 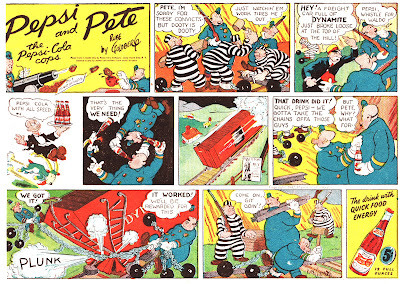 If one ad series deserves a complete reprinting it is those delightful Pepsi Cops which ran all the way through the forties and was done by various artists (which you can see if you follow the link). They were probably designed by the first artist, Rube Goldberg, as you can see in this early sample. And this one is completely new and unknown to me as well. 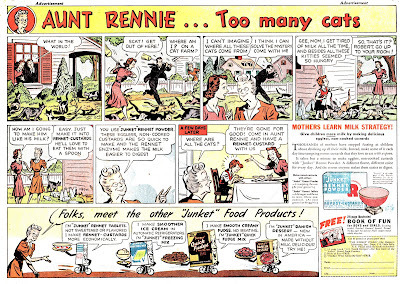 I don't remember the ads for Junket, but as child I remember having Junket Rennet desserts, which, to me, were sort of in between a pudding and Jello, closer to a custard without eggs. I have not see this product in American food stores for maybe 30 years, nor a replacement for it. Can you still taste it, though? Not so much taste, as remember the texture: like a loose flan.